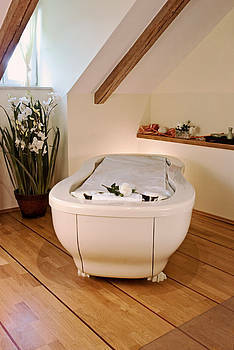 Dim lighting, a lovely designed room, and right in the middle, the elegant Haslauer Soft-Pack-System® I Day Spa. 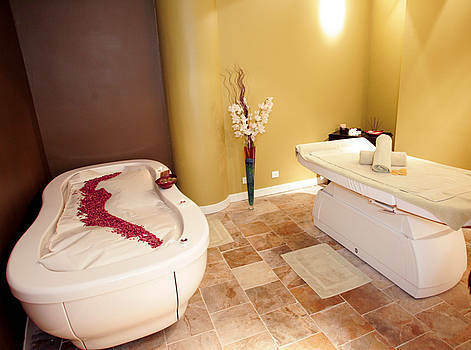 Valuable crémes, fragrant nourishing oils, herbs, algae, blossoms and leaves are ready to be applied during the treatment. Your guests can simply relax and enjoy. The nourishing créme is applied with gentle strokes. Soft and smoothly, the body is cocooned in the membrane. 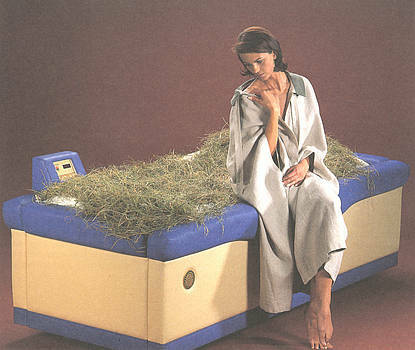 The bed is lowered without a sound and a warm, comfy, and weightless feeling is sensed. Tentatively, heat approaches the body. 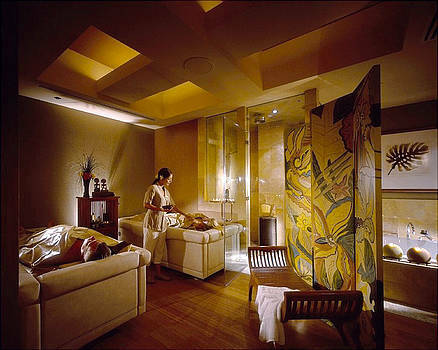 Neither disturbing music, light effects, nor noisy massage jets interrupt this unique relaxation experience. Simply wonderful! Only with the Haslauer Soft-Pack-System® I will your guests plunge deeply and be completely cocooned in just the right temperature. A thin, smooth membrane surrounds the body, so that guests are not in direct contact with the water. The membrane cuddles the body due to the water pressure and the products are able to seep into the skin (occlusion effect). This way, the body can absorb more active agents. The pure and natural Kurland® products used are not diluted and are without preservatives. Gradually, increasing temperatures and weightless reclining lead to a relaxation of the muscles and the support apparatus which in turn increases the therapeutic effectiveness. Due to its various treatment possibilities, the Original Haslauer Soft-Pack-System® I has long since become an essential standard requirement for treatment professionals. It allows various treatments, such as a cosmetic skin care, body wraps, Moor mud and fango wraps, hay baths, Cleopatra wraps, as well as Thalasso and Vino treatments. The Original Haslauer Soft-Pack-System® I is the ideal system for body wraps. A facial treatment can also be done at the same time for a highly efficient service. More than 30 recipes enable you to offer attractive, new Spa treatments time and again. The Original Haslauer Soft-Pack-System® I is therefore an ideal piece of equipment for every Hotel Spa or Treatment Suite. The sophisticated technique convinces with extraordinary longevity, a specially soft and durable membrane, ‘ready to plug’ performance, and simple assembly. 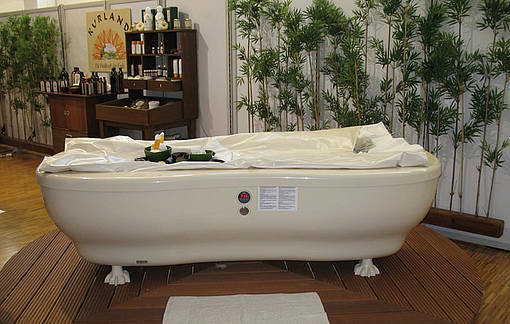 Are you interested in our modern, elegantly designed Day Spa range? The lifting system with integrated pump and the use of fibre glass make the Soft-Pack-System® I Day Spa a attractive and very economical piece of equipment for body treatments. 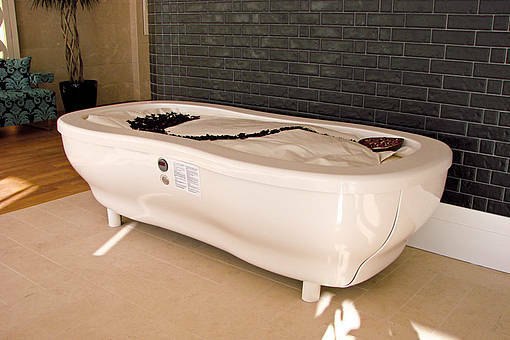 Available in various colours, its design will definitely suit the style of your wellness area. We will be happy to show and explain to you both systems!